It’s been a fairly warm winter and we only had one good snow storm — but it’s been a dark one with lots of rain. There were countless days in which all I wanted to do was to cozy up with a steaming cup of tea and somebody else’s book. But work on my own book was necessary. I reread and reread to check for mistakes that the editors, proof reader, and I all had missed. When the first day of spring arrived in March, I felt burned out on my story and wanted to throw it in the glowing coals of my fireplace. Fortunately, there were voices out there that told me to take heart, that many writers feel burned out at this stage of the game. I’ve been away from my rereads for over a week now and feeling much better about the whole thing. I’m beginning to feel very excited as the back cover is coming together with great blurbs from a few people who have already read it. My airline tickets and hotel reservations are set for my trip to Chicago next month for Book Expo America, and my publicist spent an hour on the phone with me, giving me tips on what to expect along with lots of convention etiquette. The point is that regrets are built on the steps we don’t take to live out loud. I figure that I’ve been birthing this book for a long time and I must do everything I can do to bring it to life. If an infant isn’t breathing when it comes into the world, nurses and doctors don’t give up on it without trying to save it’s life. I’m not about to let my book die in the delivery room. I want her to be breathing nicely when she hits the first book shelf. In the meantime, it’s April, and I have about six weeks before I need to worry about all of that. The days are longer and sunnier, I think the robin who kept me company in the garden last spring is back, and the greening of the new season seems greener than ever. I celebrated an unusual happening this past week when two, yes that’s 2, handwritten letters arrived in my mailbox on the same day. One was a three page missive from grandson, Noah, to his grand dad, about a trip they are planning together, but he sent me his best wishes and love as well. The other was a thank you note from a friend who had recently visited me in Charlottesville. How many handwritten letters get delivered to your mailbox in one day, week, or year? Once this book thing is done, maybe I’ll start writing letters to friends with a pen on real paper like I used to. I believe there is something very precious about someone taking the time to write me note using their hands, putting a stamp on it, and sending it through the mail. No one does that anymore. 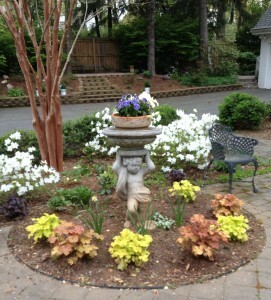 I’m also celebrating my garden which is more beautiful than ever this spring. 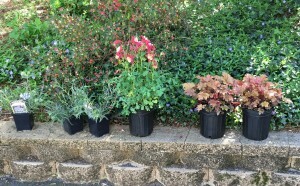 On Friday I went to my favorite garden center to find some plants to in fill a few empty spaces. The varieties of flora took my breath away as I ambled up and down the aisles of ferns, hellebores, columbine, early blooming irises, and peonies. What to choose? How many? Which color? I came home with a variety of things that I’ll have to cover for the next few nights. It seems that winter isn’t giving up it’s hold on the weather just yet. Last week’s 70 degree weather will be gone for a while, but will soon return. At least we’ll not get snow like so many places north of here are promised. There is lot’s going on in the future to worry and think about. But for now April charms me with her promises of a garden full of flowers, the first butterflies of the season, and birds singing their heart’s out in the early morning light. Do you have a Big Challenges List and how do you keep yourself grounded in the present moment? A member of the thrush family, American Robins are our most common birds. When they return from their winter travels we know spring is on it’s way. Here in Virginia they only seem to disappear for about a month or two in January and February. There are usually one or two that hang on even in the coldest months and I’ve often wanted to knit little jackets for them. I don’t put bird feeders out because I have a cat. I don’t think they eat many seeds anyway. This year, when they returned from where ever they go, they came in huge flocks. The neighborhood was filled with their sharp clucks and trills and as the days passed some moved on further north. They’re found on most everyone’s lawn, digging about for juicy worms and grubs. They are as American as apple pie, baseball, and the Big Mac. When I was about ten years of age, a robin became my pet for the summer and when he died later in the fall, I was heartbroken. You can read that story here. 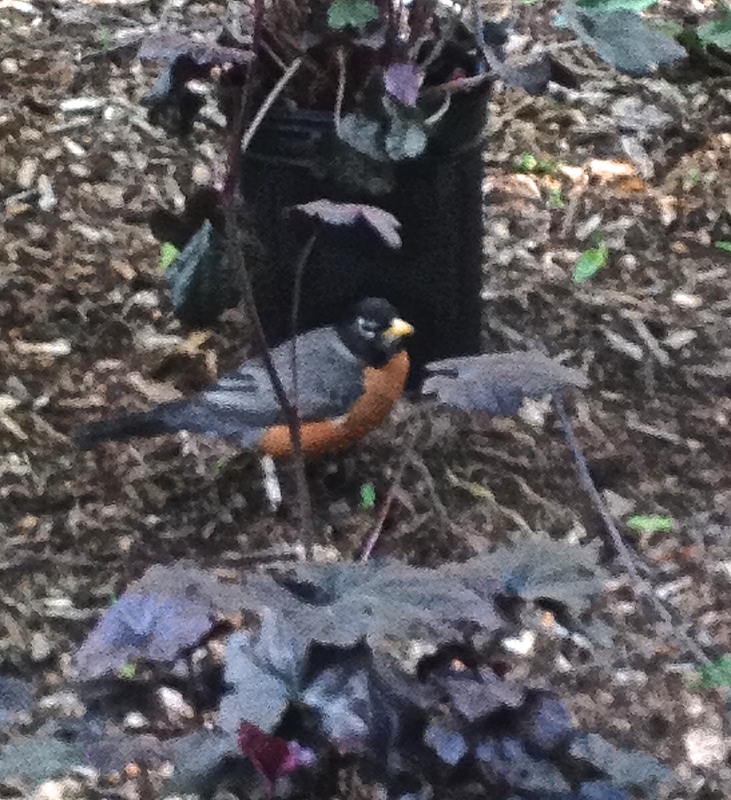 This year one of the Robins that frequents my garden and its numerous birdbaths, has become my gardening buddy. 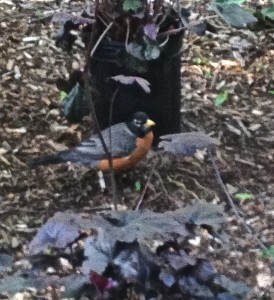 He’s a handsome guy, with a black head and tail feathers, charcoal wings and a bright orange breast. He started hanging out with me a couple of weeks ago when I started digging up plants that needed to be relocated. Once the plant was out of the ground and I was planting it in it’s new spot, Mr. Robin dove into the soil I had just disturbed. He quickly downed the worms that were trying to wriggle their way back into the damp dirt and out of harm’s way. He’s very quick and gets quite a few out of every hole I dig. When I start talking to him about how lovely the day is or ask about his family who must be nesting nearby, he stops digging, tilts his head to one side, and stares at me. Over the past few weeks he’s gotten closer, maybe two feet at times. When I told a friend about him, she was worried that I wouldn’t have enough worms in my garden to keep it healthy, but I’m sure there are plenty to go around and I don’t mind sharing the bounty. The whole idea of keeping a garden is to relax among the plants and attract wildlife whether it be a plain old robin or a rabbit looking for a carrot patch. The other day when it was raining and I chose not to work in the garden, I found Mr. Robin out on the patio near one of my french doors. He was looking right at me through the glass, chirping up a storm. Was he calling me to come out and dig a few holes for him? Maybe not, but with my creative imagination, I had to wonder. There are other numerous robins about but they all fly off as soon as they see me. This robin, however, is usually not visible until I start pottering about the yard. He hops about, inspecting the soil where I’ve just been working, gathers half-a-dozen or so juicy worms and flies off, returning a few minutes later. 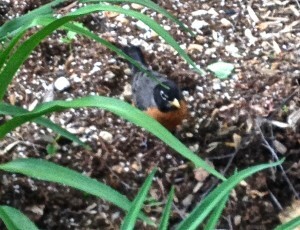 I presume he is feeding Mrs. Robin, who is keeping their light blue eggs warm. Oh yes, what about the cat you ask? Lilli is getting on in age and stays in the house most of the day. Though she still stalks birds, she goes out later in the afternoon when the air has warmed up nicely, but by then it’s too warm for me to be gardening and Mr. Robin is hanging out elsewhere. When summer heats up, Lilli will be out and about more than she is now, but I will be done with the digging and planting by then. Mr. Robin will probably go off into another garden where no cats wander about. When we moved into our home back in 2010, the gardens were minimal. 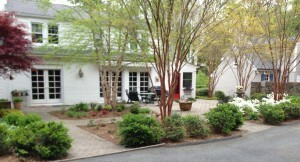 In the back yard, there were 6 small garden plots set into a large patio of concrete pavers. 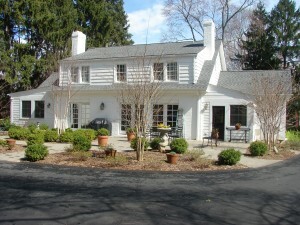 In three of the plots were freshly planted Crepe Myrtles about fifteen feet tall. They have lovely white flowers in the summer. 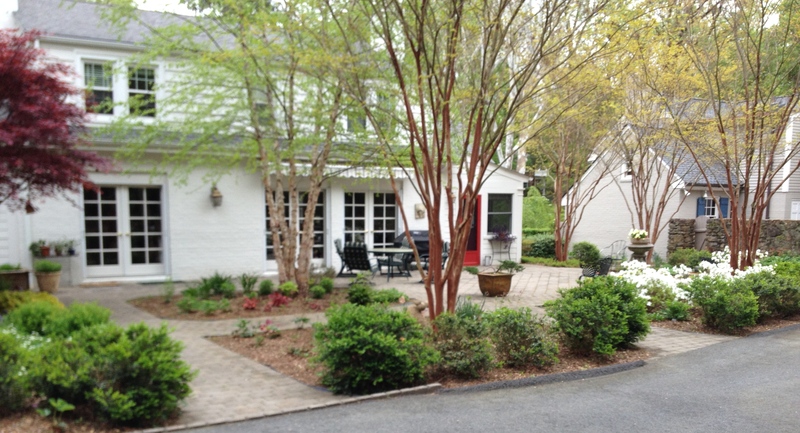 Another held a red Japanese maple, and another a river birch, both about the same height as the other trees. None of them were tall enough to provide us with shade, so we added an awning to the back of the house. 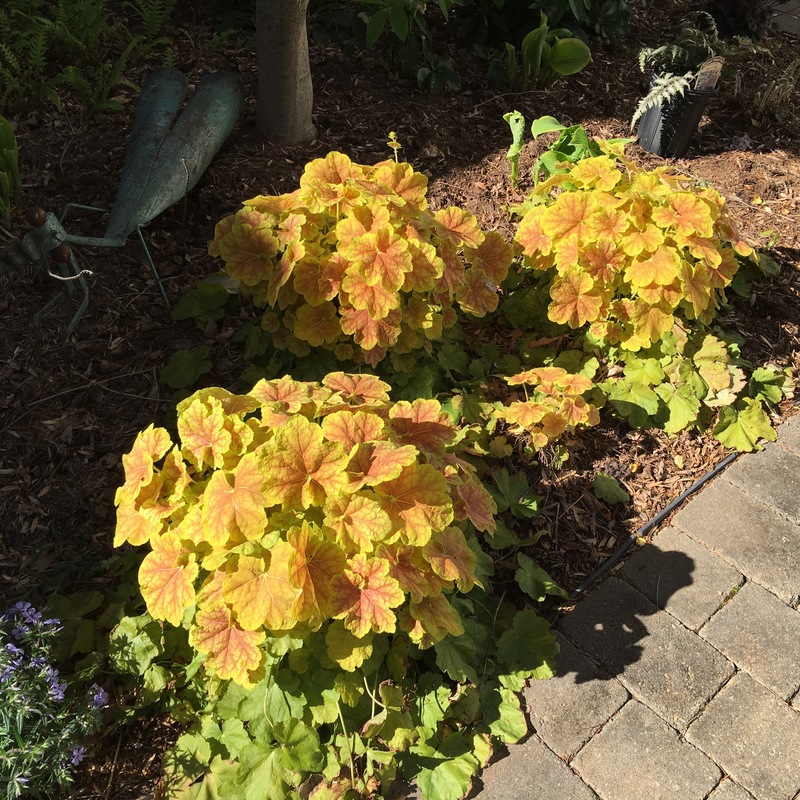 I planted shrubs and flowers that needed full sun in order for them to grow and blossom. I continued to do so until last summer when I realized those sun loving plants weren’t doing so well. 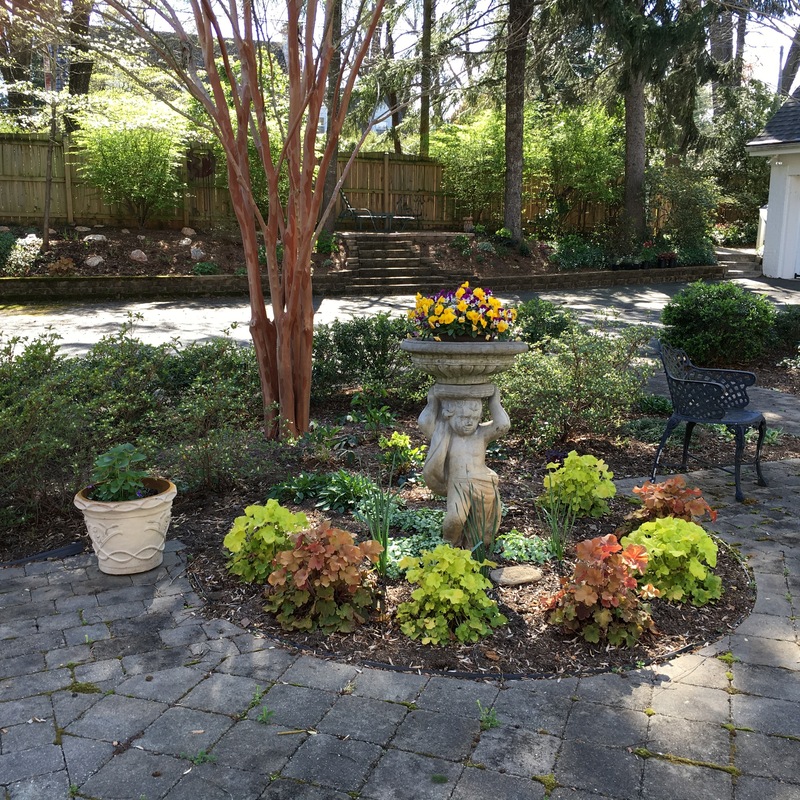 Over the past five years, the trees have grown so large that now our once sunny patio is a beautifully shaded garden that now has to be redesigned. And the awning? 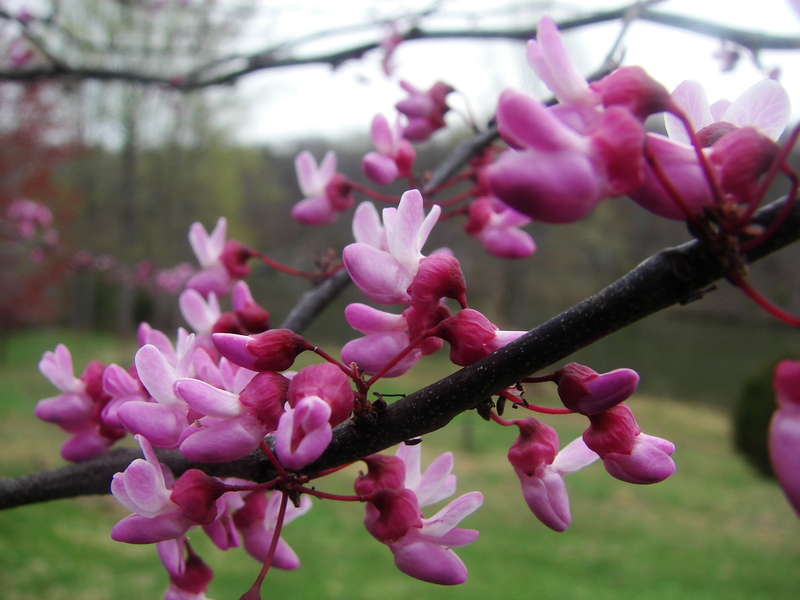 We use it on sunny days in the spring and fall when there are no leaves on the trees. 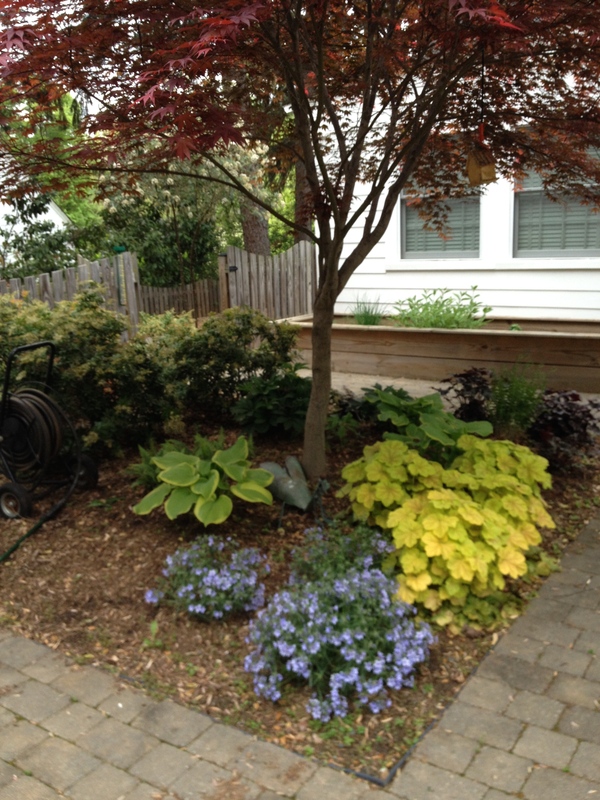 I began making a few changes last year when I replanted the bed where that marvelous, Japanese maple stands with shade loving plants. I moved Hellebores from the front of the house to the base of the tree, and added several kinds of ferns, hostas, and coral bells (heuchera), some with purple leaves, others with lime green leaves with reddish pink highlights. Pale blue, shade loving phlox are set off in one corner. It was gorgeous last summer, and this spring it’s back and popping with color. 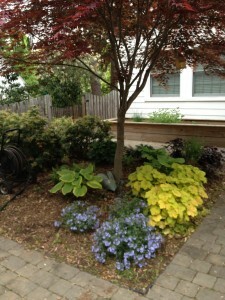 The plants are larger and fill the space nicely. In the one bed without a tree,and receives sun most of the day, we planted strawberries. It was pretty thin last June but I did manage to pick about a dozen or so sweet, juicy berries that taste so much better than those bought in the store. And they’re organic. 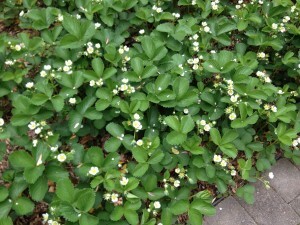 Over the winter those plants sent out runners in all directions and we now have a full strawberry patch. 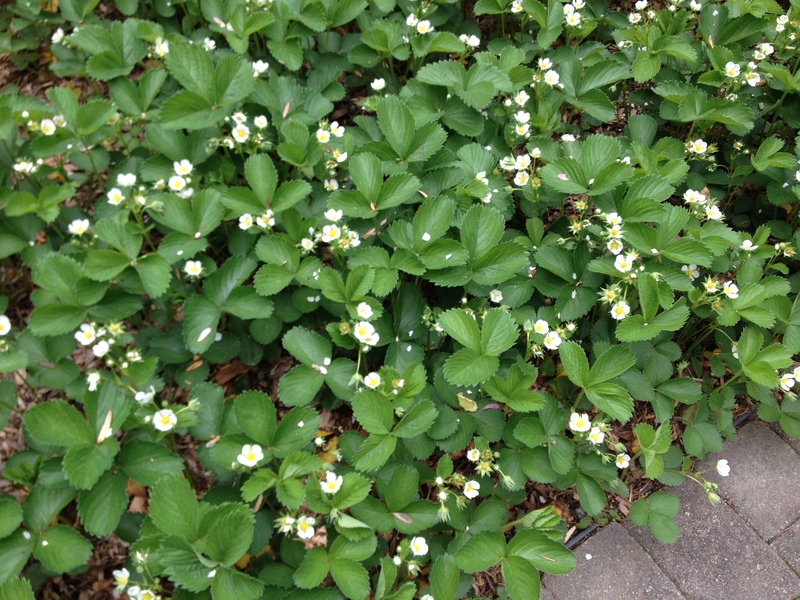 If their white flowers are a sign, they’ll fill my larder with a large crop of berries with which I may have to make some jam. That is, if I can get to them before the squirrels and birds do. A few years ago, we put a raised bed in a sunny corner where I grew tomatoes, eggplant, and sweet peppers. But with several amazing farmer’s markets in the area, I can get all of the fresh summer vegetables I need without the extra work. I’ve turned it into an herb garden. 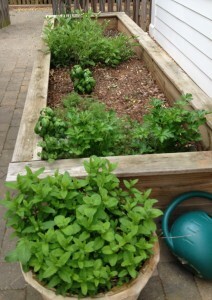 In it I plant basil, parsley, sage, rosemary, chives, cilantro, and dill. Several types of thyme and oregano are tucked into a rock garden that runs below the old stone wall that separates my yard from the neighbors. It’s an area that gets both sun and shade, and most plants tend to do well there. The rest of the beds are still a work in progress and this spring I’ve already begun to pull plants up, and move them to sunnier locations. 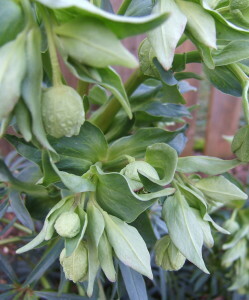 In their stead I’ve planted some new hellebores in colors I didn’t already have. I also planted more heuchera, and as the season progresses and new plants continue to arrive in area nurseries, I’ll be adding more ferns, hostas, and whatever else strikes my fancy and loves shade. During my social media sabbatical I never did get far on the weekly visual journal that I’d longed to start. Though I began filling in background for one page, I never finished it. I’ve carried my frustration into the spring, but now my longing to make visual art is sated, as I’m creating and painting my garden with plants. 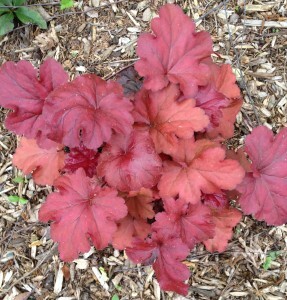 Gardens are constantly changing. Next year I will likely need to thin things out and continue to move my happy plants around a bit more. I hope that the seeds, bulbs, and roots you plant in your garden will flourish and fill your days with grace. That tirade continued for another fifteen minutes before I realized that my neck was sinking between my shoulders, I had a headache, and the pit of my stomach was roiling. It was time to let it go. I was turning myself into an anxious mess. I went out into the garden and started removing the dead leaves of the hellebores I so love at this time of year. Their spotted white, pink and purple flowers are a bit late this year. 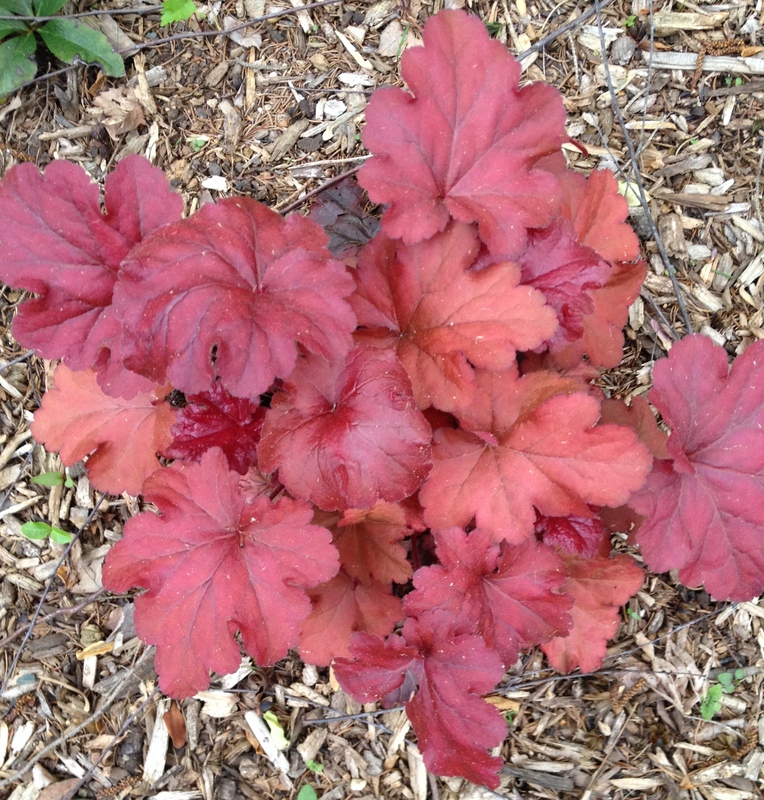 They’d been beaten down and battered throughout our amazingly dark, cold and snowy winter. They need to bathe in the warm spring light. When I was done they were all standing tall and breathing deeply. I decided to do the same thing. 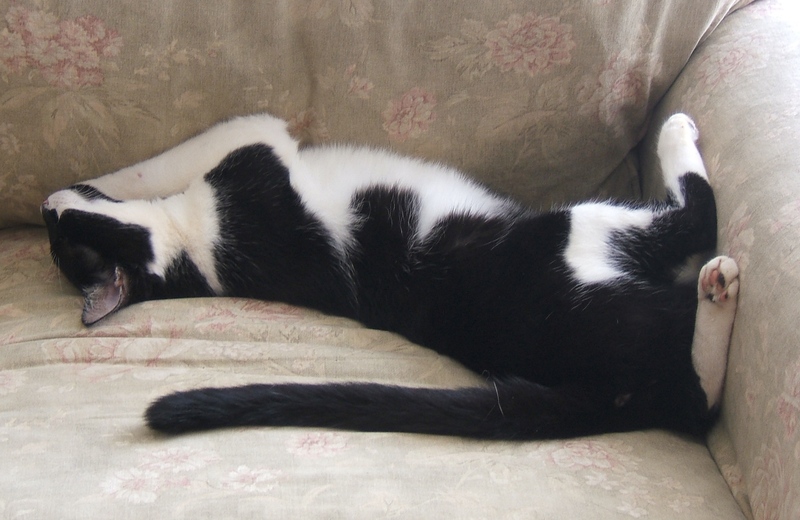 Doubting Dotty isn’t in sight and I hope she stays away forever. But I know all too well, she has a way of sneaking in the back door when I’m not looking. She’ll probably be back in the near future. When she shows up again I’ll just go out into my garden, get my hands dirty, and be with my plants.